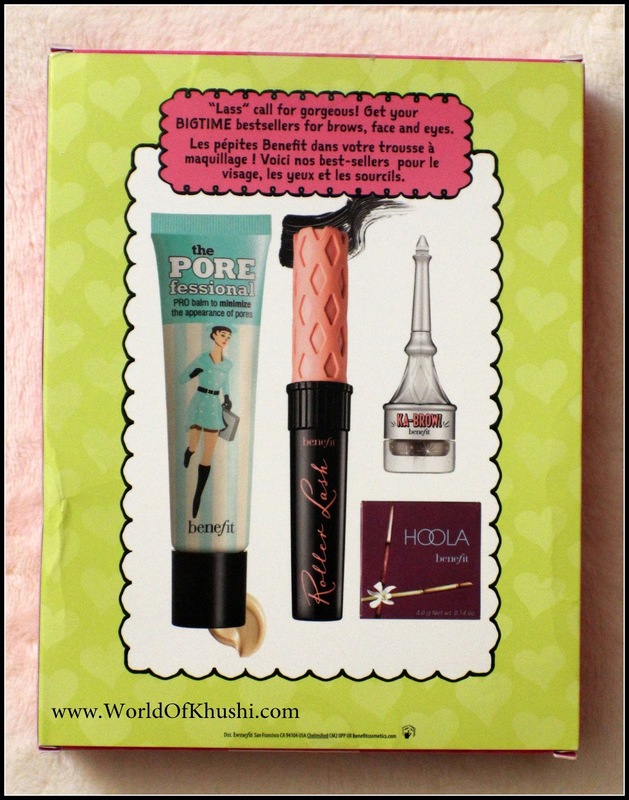 Today I am reviewing one of the Holiday Set of 2016 from Benefit Cosmetics. Product is Benefit Sassy Lassie Gift Set $39. It contains 3 Full size products & 1 Travel size. I brought this product from Sephora. This Review is not same as my other Reviews, here I am only giving the Idea to Buy or not to Buy. I will later share my thoughts for individual products in other posts as I just bought this product & have used only once till now. Well Well Well!!! Lets look at the picture, Yes! again look at the Benefit Sassy Lassie Gift Set Packaging. Don't you guys love this. 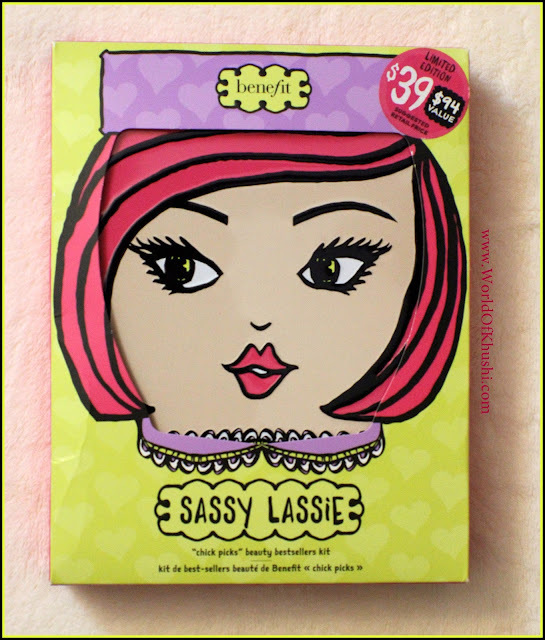 I just love the packaging, very Cute & very Girly. Plus you can Reuse this box as Makeup or Jewelry Storage. Love this Box!! It gives you 3 full size & 1 travel size products which is a great deal. I really wanted to try Hoola Bronzer & Porefessional is one of my favorite Primer. Mascara is one of their best sellers. In short, Impressed with the choice of Products in this Set. If I bought only Porefessional Primer that will cost me $31 and Bronzer cost me $15. So these two product themselves will charge me $46. 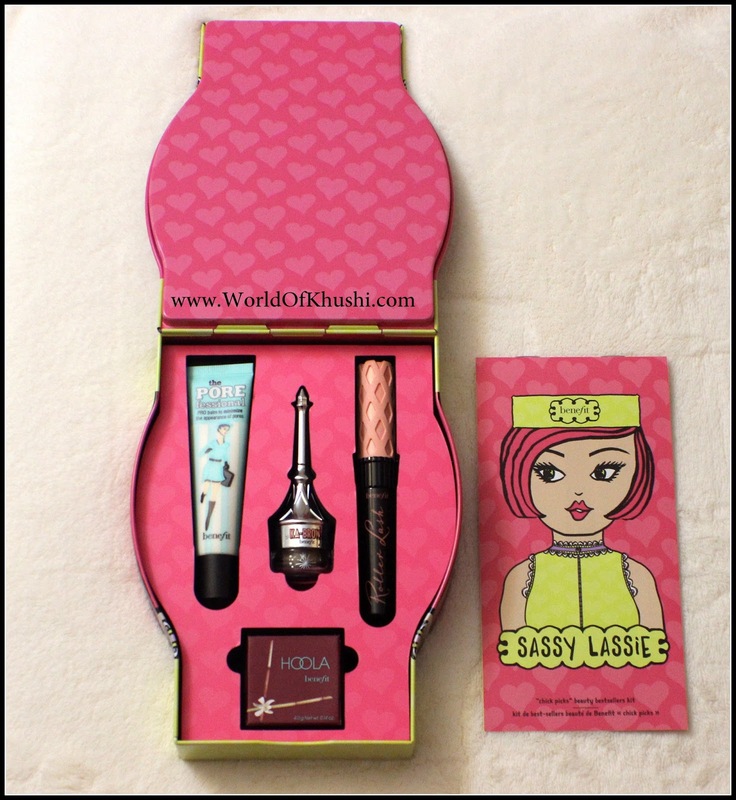 But this Benefit Set price is $39 which is great. Two products from this set I already wanted to buy, apart from that I gave a chance to try Mascara & Brow Gel. Yes for Brow Gel I am not very sure because it's in Medium Shade & my Brows are dark in color. But I guess I can make it work!! Overall Price-wise I like this deal. Buy or Not to Buy ?? Well! Buy it!! :) This deal is great, don't miss it. 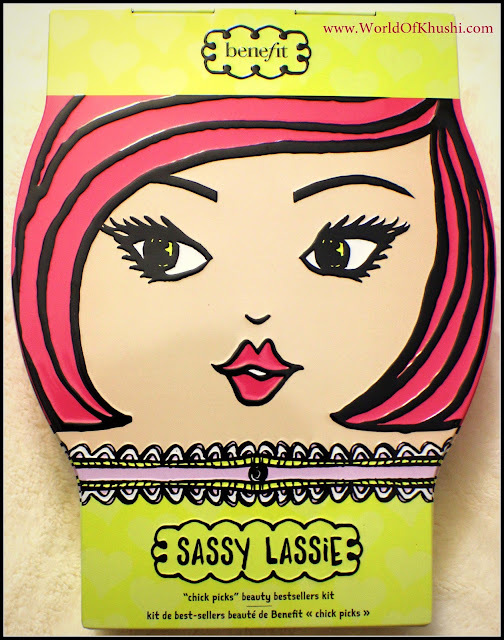 This is my small Review for Benefit Sassy Lassie Gift Set. I will do specific Review on every product once I start using them. I hope you girls have got some Idea on whether to buy or not to buy. I really like this deal & hope you guys like it too. There are many cash back websites like Ebates (US) where you will get Cash Back on your Purchase.So you can go to Sephora using Ebates to get even more savings. If you guys want me to do any specific product Review of your choice, let me know!! 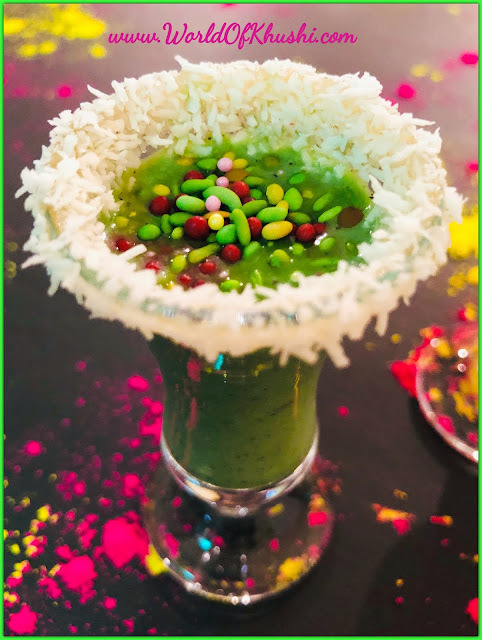 For more such Reviews stay tuned with Khushi's World.